Pop / jet / thumper bumper cap. 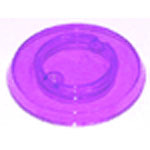 Purple (violet) transparent plastic. Used on some late-model Bally and Williams games but may fit on other makes/models such as Data East, Sega, and Stern games. NOTE:Most caps will naturally have a few various light superficial scuffs when new, which are from the manufacturing process, as well as shipping and general storage/handling. These were not individually bagged or wrapped when produced at the factory- just manufactured and shipped all together in boxes/bins. If you require a "perfect" cap for a high-end restoration or similar game, please check with us before ordering, but otherwise please be aware that these were not made to go in museums, but on games run in arcades, bars, bowling alleys, etc., so some minor imperfections may be present as a result of the normal manufacturing and shipping processes.